More industrial than artisanal, Dubost combines high quality products with pricing that reflect its ability to mass produce them. 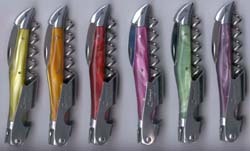 Handles are available in various colored ABS, acrylic, rosewood, and natural horn. Packaging can be in beechwood wooden boxes or cardboard, and both the packaging and the blades can be personalized. Ref. 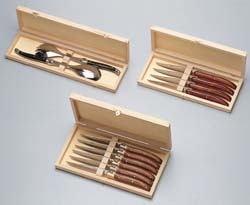 98 13754, two piece carving set and three sets of steak knives with black ABS, rosewood, and black natural horn handles. Ref. 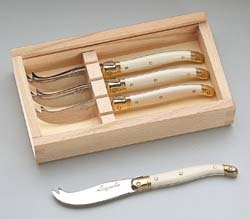 79134, set of four cheese knives with brass bolsters and white ABS handles in a wood gift box. Ref. 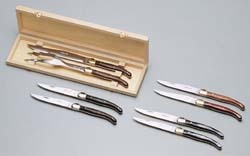 98218, two piece salad service with black ABS handles, four and six piece steak knife sets with rosewood handles. Ref. 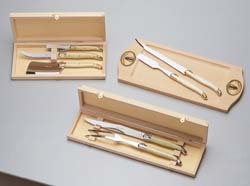 98316, three piece cheese service with ivory ABS handles, two piece foie gras service with white ABS handles and cutting board, two piece carving set with white ABS handles. Ref. 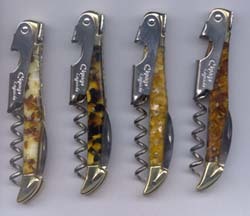 Cepagescaille, four Laguiole wine waiter corkscrews with special flake handles. Copyright © 2012 - TW McGuire International - All Rights Reserved.